Truepoint’s estate planning guidance is designed to ensure clients structure their estates to preserve wealth and pass along assets in line with their goals and values. We believe estate planning is an essential element of financial planning and wealth management. Our process starts with conversations about relevant estate planning vehicles, the importance of updated documentation and ensuring our clients’ intentions are clearly and fully articulated in estate plans. Our in-house estate planning specialists know how to manage the intricacies and requirements of such plans. We help clients identify the most appropriate ways – whether outright or in trust – to distribute assets and property to beneficiaries and develop documents and title assets to minimize costly processing fees, estate taxes and potential penalties. While effective estate planning requires rigorous quantitative analysis, qualitative issues should never be overlooked. 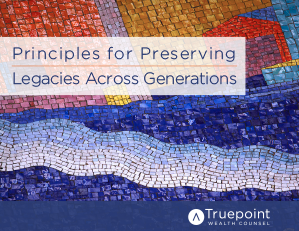 Truepoint’s estate planning pros help clients explore the full range of potential opportunities a substantial estate can create, including wealth preservation across generations or the creation of a philanthropic legacy. The end results are customized estate plans that effectively address the big issues and handle the many important details.